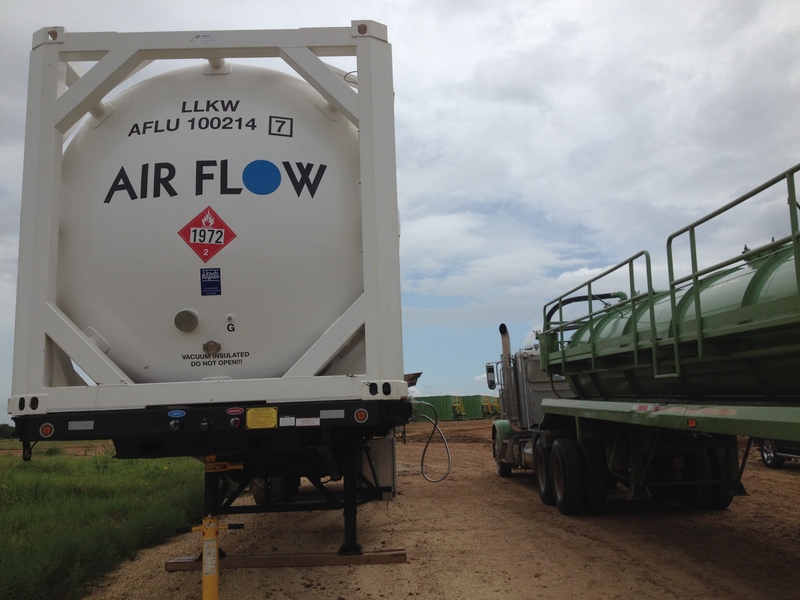 A recent contract signed between Air Flow North America and IPC USA, a California based LNG supplier, has allowed both companies to realize a truck fueling operation. 30 trucks running on LNG are being fueled safely every day thanks to Air Flow’ s 45ft King iso container temporary solution. The installation is safe, reliable and cost efficient. With the 14,000 gallons net LNG capacity of the tank, an entire LNG transport trailer can be unloaded avoiding expensive multi-stops and decreasing logistics costs. Drivers were trained to use the system that is well adapted to the consumption of the site and also to this type of fueling activity. “ It’s a real team effort that was made on this project. Logistics, equipment availability and technics were all put together involving the two companies to cooperate in order to have a solution that works. The most important is the final user ‘s satisfaction and this particular installation has allowed him to maintain his activity while the stationary equipment is being built.” says Kelly MARULL, business development at Air Flow North America.